The recent judgement by the Supreme Court’s Constitution Bench on reservations is not only important for its order on excluding the creamy layer from the quota ambit and the need for a time-bound filling of vacancies for the reserved categories. It is equally important for its obiter dicta that Parliament cannot encroach upon the citizens’ fundamental rights and disturb the basic structure of the Constitution. Gender discrimination is a way of life almost all over the world, particularly so in India. Women are especially susceptible when they are at home. In many households, their status is no more than that of a beast of burden. They are supposed to work like a galley slave round the clock and yet suffer physical as well as mental abuse of the worst kind. Prime Minister Khaleda Zia of Bangladesh, who hands over power today to a caretaker administration at the end of her five-year tenure, is doing all she can to ensure her Bangladesh Nationalist Party’s (BNP) victory in the elections due early next year. She has rejected almost all the demands, including that for electoral reforms, of the Opposition led by Sheikh Hasina Wajed’s Awami League. India’s gradual emergence as a rising power is being widely acknowledged the world over. The US inclination to help India rise faster, as also the strategic partnership being sought by a number of powers is not without reason. Whatever be the US criteria, to counter veil China or to ensure space for itself in Asia which the Chinese are trying to deny it, India’s relevance in the fast evolving global scenario is more than obvious. AS the Sub-Divisional Magistrate (SDM) at Kalka, a decade ago, I had been able to overcome some challenging obstacles during the course of executing my duties. The people of the sub-division, which included Pinjore and 110 villages, apart from Kalka town, were by and large satisfied with the administration at the time, it had seemed to me. The conflict in Iraq is drawing fewer foreign fighters as Muslim extremists turn their attention back to the symbolically important and increasingly violent turf of Afghanistan, say anti-terror officials in Europe and the United States. Kofi Annan became Secretary-General of the UN in 1997, placing administrative reform high on his agenda. A decade later, as he prepares to bow out at the end of the year, streamlining the management of the UN remains a priority for its member states. Red tape, cronyism and corruption, especially in the Iraq oil-for-food scandal, have raised questions about his managerial style. While Congress is yet to realise the gains of its move to implement quotas for OBCs in higher educational institutions, the step has contributed to assertion by its own OBC leaders about getting a better deal for themselves within the party. In Punjab, which will face assembly elections early next year, OBC leaders are building pressure on the party leadership not to overlook their claims for tickets. The recent judgement by the Supreme Court’s Constitution Bench on reservations is not only important for its order on excluding the creamy layer from the quota ambit and the need for a time-bound filling of vacancies for the reserved categories. It is equally important for its obiter dicta that Parliament cannot encroach upon the citizens’ fundamental rights and disturb the basic structure of the Constitution. Significantly, while protecting the citizens’ basic rights, the court has said that Parliament has the right to make laws in tune with the changing needs. 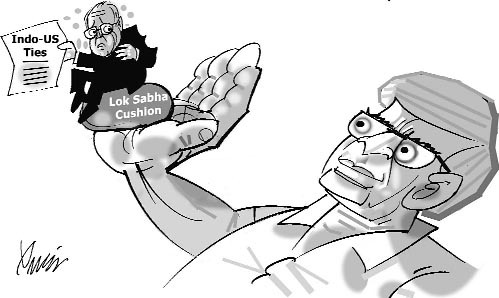 Widening the powers of the legislature, it ruled that the Constitution, instead of being a fossilised structure, does have the resilience and flexibility to meet the emerging problems and challenges. However, while responding to the changing needs, Parliament cannot tamper with fundamental rights (under Articles 14, 19 and 21) as they formed a part of the basic structure of the Constitution. This can be regarded as a unique example of judicial independence in preserving the sanctity of fundamental rights. This is also a reiteration of the apex court’s stand in the Keshavananda Bharati case in 1973 which elucidated the philosophy underlying the basic structure doctrine. The Indian Constitution is not a mere political document. It is based on a social philosophy with two main features, namely, basic and circumstantial. The former remains constant but the practices associated with it may change to respond to the challenges. Similarly, the Constitution contains certain features which are so essential that they cannot be changed or disturbed by the government of the day or Parliament. This same rationale for judicial intervention underlies the other initiatives as well. The social philosophy upon which the Indian Constitution is based is egalitarian, representing a commitment to restructure society to conform to the precepts of social justice and a welfare state. In this context, the Supreme Court’s obiter dicta can be regarded as an essential safeguard against state or executive arbitrariness. As the sentinel of the Constitution, the apex court protects the citizens’ basic rights. This is ordained by the Constitution and, therefore, there should be no two opinions about the powers of the judiciary vis-à-vis the legislature and the executive. Gender discrimination is a way of life almost all over the world, particularly so in India. Women are especially susceptible when they are at home. In many households, their status is no more than that of a beast of burden. They are supposed to work like a galley slave round the clock and yet suffer physical as well as mental abuse of the worst kind. The Protection of Women from Domestic Violence Act, 2005, which has come into effect from Thursday, is a laudable attempt to address this burning problem. Under the all-encompassing legislation, a husband beating or insulting his wife can land in jail and become liable to a fine up to Rs 20,000. Significantly, domestic violence under the Act comprises not only actual abuse but also the threat of abuse, whether physical, sexual, verbal, emotional or economical. Thus, it will hold the husband and his family liable for dowry demands as also insulting the wife or preventing her from taking up a job. Not allowing the woman to use her salary, too, will be included in the definition of domestic violence. Another significant feature is that the Act will apply not only to husbands but also to live-in partners. Such socially relevant laws have become the need of the hour because of the hopeless situation in which a large percentage of citizens have to live. This is of a piece with a legislation passed recently to ensure that under-age children are not employed in homes or commercial establishments. Enforcement, of course, will depend on the sincerity of the enforcing officers. Even more important, it is the suffering women themselves who will have to come forward to demand a halt to their maltreatment. That may not be an easy task in the prevalent social milieu. At the same time, there is need to address the apprehensions about the likely misuse of the law. For instance, the Save Indian Family Foundation has said that the new law will lead to economic blackmail of men. Surely, safeguards can be built into the system to eliminate such a possibility. But the law, per se, is a step in the right direction towards ameliorating the lot of women. Prime Minister Khaleda Zia of Bangladesh, who hands over power today to a caretaker administration at the end of her five-year tenure, is doing all she can to ensure her Bangladesh Nationalist Party’s (BNP) victory in the elections due early next year. She has rejected almost all the demands, including that for electoral reforms, of the Opposition led by Sheikh Hasina Wajed’s Awami League. As a result, both sides are preparing for a repeat of the past —- elections accompanied by violence and rigging. This time, however, the situation seems to be taking a turn for the worst. The head of the caretaker administration, retired Supreme Court Chief Justice K. M. Hasan, is well known for his pro-BNP views and hence the Awami League’s opposition to his nomination for this crucial position. Even those not committed to either of the two major parties believe that it would be a miracle if the elections are conducted smoothly and peacefully. Bangladesh is undoubtedly heading for political uncertainty. Some time ago the League had threatened to boycott the poll if it was held without the necessary electoral reforms. What will be its stand now is not known, but it has given enough indication that the League may go to any extent to prevent the BNP from taking advantage of the system designed for Begum Zia to recapture power. Besides the pro-Khaleda Zia caretaker government, the Bangladesh Chief Election Commissioner and his deputies, too, are sympathisers of the BNP. The outgoing Prime Minister has been under tremendous pressure to have new faces in the commission to give it an independent image. But she stuck to her guns, saying that under the circumstances no change was possible. She also ignored the demand that the titular President, Mr Ijazuddin Ahmed, should not be the constitutional head of the armed forces during the interim arrangement for running the government. All is, therefore, set for a confrontation between the BNP and the religious parties on the one side and the Awami League and some other secular parties on the other. The Indian economy is growing at an impressive rate of about 8 per cent with a clear potential to grow further. But that is not really enough. Economy alone doesn’t take a nation too far in today’s power politics. Nor does, for that matter, the military prowess by itself. Both Japan and Russia are world powers in one sense or the other. Yet they do not command the same attention as, for example, the US or even China. If the US can force others to act as it wants them to, it’s only because its economy and the armed forces are strong enough to back its motives. India is still viewed as a growing economic power only. It is yet to develop power parameters that would enable it to pursue national interests as it desires. No wonder, India was unable to pressurise Pakistan despite 10 month-long army deployment along the international borders. On the contrary, India ended up reinforcing Pakistan’s nuclear deterrence and eroding its own credibility. India has also not been able to restrain Pakistan from carrying out its cross border terrorist activities ever since 1989 or even influence powers that be to dissuade it from doing so. Nor has India been able to resolve the Kashmir imbroglio. It’s only because India does not have the requisite power criterion required to achieve such objectives. It is yet to develop its military potential sufficiently to compliment the economic ingredient. In fact, promotion of national interests by employing the economic prowess or the military muscle has never been a part of India’s political culture. The leadership lacks such modern virtues unfortunately. It has to be understood that powerful armed forces are as essential a prerequisite as the economy for national foreign policy to be effective. If the US is able to achieve its foreign policy objectives the way it does, it’s only because it has a very powerful instrument of military to back it everywhere. In our case, the military and the Foreign Service mandarins, sitting together in same South Block, can hardly boast of much interaction. Unfortunately, we in India have done nothing to build this all-pervasive instrument of power. But for the 1962 debacle, India’s armed forces would have been no better than any paramilitary forces. Nehru is on record saying that the police was good enough for a peaceful country like India. He failed to comprehend the fast-changing strategic environment around him. And when the Chinese routed the WW-2 vintage Indian Army, he was shocked from which he never recovered. In a way, we owe a lot to China and Pakistan for stirring our strategic consciousness. But we seldom learn from history. After the pendulum swung from one end to another during the periods of wars that India had to fight, it sadly got settled at the measly level of 2.5 per cent or so of GDP. Anything less than 3 per cent or so is not enough to keep the armed forces technologically contemporary and ever ready for unforeseen eventualities. It came out clearly during the Kargil conflict. It is the technological edge over the adversary that decides the course of the war. In fact, the powerful armed forces hold sway over the very ability of a nation-state to apply diplomatic and political pressures in pursuance of its interest. But our leadership is much too insensitive and the bureaucracy unresponsive to the changing times that require a modem nation-state to have a deterrent force levels at all times. Even when funds are made available, a large part of the money gets surrendered year after year, despite the pressing need of modernisation. Weapon procurement procedures remain archaic and time consuming. On top of it all, the armed forces have to contend with pusillanimous decision-making. Delayed decision-making has led to astronomical cost escalations in the past, besides compromising the combat potential of the armed forces and the national security. Here is an example of how the Ministry of Defence works even on these days of time constraint. For some inexplicable reason, it failed to finalise the tenth Defence Plan (2002-2007) in time. The Finance Ministry could approve of it only in December, 2004. With just a year to go now and the 11th plan (2007-20 12) slated to begin soon, large sums of money remains unspent. As against Rs 4,18,000 crore earmarked for the tenth Defence Plan, only Rs 3,62,000 crore could be spent so far. It is strange that the bureaucracy is not held responsible even when its ineptness results in impeding the national progress. Lack of long-term planning, inter-service prioritisation within the services and the ministry and total absence of coordination with the Finance Ministry are some of the lacunae that have to be rectified fast. It is not only bureaucrats but also defence scientists who are similarly responsible for the sorry state of affairs in which the armed forces find themselves today. The lackadaisical approach of DRDO scientists is largely responsible for not meeting the armed forces’ requirements indigenously. Defence public sector units and ordinance factories have all remained highly inept and unproductive, to say the least. The Parliamentary Committee on Defence had to advise the government to make immediate efforts to restore the IAF potential at the earliest. At present, the IAF is in no position to deliver the goods as expected of it in the case of a war. Successive governments have let the TAF strength be depleted to such an extent that it may not be possible to regain the authorised strength even by the end of the l2th plan period in 2017. Hopefully, the 11th plan period would arrest the rapidly declining IAF force level from 39.5 combat squadrons in the eighties to merely 29 by next year. It certainly does not augur well for a nation that has high aspirations. The Army and the Navy, too, are in a similar state as the Air Force. The Army needs new weapon systems for fighting short and high-intensity wars in a nuclear background and meeting the challenges of fast deteriorating internal security. Its projections have not yet materialised despite the urgency; the Navy is no less worried as regards its declining force levels in critical areas of ships, submarines, helicopters and weapons. The lackadaisical attitude of successive government towards modernisation and the DRDO has led to slowing down the progress in this all-important area. After years of reinventing the wheel, the armed forces are forced to look outside for their requirements, putting their long-term re-equipment plans in jeopardy. Due to the imperatives of secrecy, the DRDO has never been accountable to anyone. The gap between their talk and achievement is incredibly large. What an irony that both the administrator and the scientist in whose hands lies the fate of the nation are not answerable to anyone. With the type of work culture prevalent in the ministry and the DRDO, deployment of futuristic weapon systems and sensors will remain a damper for India’s power aspirations. It is unfortunate that 60 years down the line, the fourth largest armed forces in the world have no legs of their own to stand. India remains dependent on foreigners for its entire range of military hardware. Anything that matters in the armed forces is imported from Russia, France, Germany, Israel or Britain. DRDO projects such as the LCA, MBT, Trishule and Akash, just to mention a few, have all disappointed the armed forces. No nation that depends militarily and technologically on outsiders can stake a claim to be a power worth any reckoning. Screws can be tightened anytime by withholding supplies and spares. Sanctions can literally bring the nation to a grinding halt at a critical juncture. The national leadership has to realise the significance of indigenous military (industrial) capabilities without which strategic autonomy, sovereignty and major power aspirations are meaningless. Until one day, when I was literally brought down to earth with a thud by a villager from a hilly hamlet called Dakhrog. We had set out on a trek to the highest village of my jurisdiction one fine Sunday morning, to accompany the Deputy Commissioner, who was on his tour of the district. We had driven up to Timber Trail, and commenced our downward journey on foot to Dakhrog, which was inaccessible by road till then. The two-hour long sojourn promised to be an enjoyable one, and there was friendly banter amongst us officers, who were guided by an aged looking but extremely agile man from Dakhrog, who wore a kurta pyjama and traditional P.T. shoes. He was quiet for a while, but as the path became more treacherous, his pace quickened along with his chatter. As we negotiated one potential fall after another, along the narrow strip of earth on that mountainous terrain, our friend accelerated as if he hadn’t a care in the world. His only grouse in life, as we heard straight from the goat’s mouth, was that the administration had done little for his village over the years. Already feeling a little offended at this slight and ready with facts and figures to counter his argument, I had little idea of what lay further in store. I was still seething at having fallen from grace thus, when we commenced our return journey. Our guide had a smirk on his face throughout our stay at the village, which was the subject of many a nightmare, in the days to come. Never have I heard sweeter words uttered by anyone, anywhere. The shift of jihadis to Afghanistan this year suggests that al-Qaida and its allies, armed with new tactics honed in Iraq, are coming full circle five years after U.S.-led forces ousted the Taliban mullahs. Afghanistan’s historic allure to Islamic militants, the lawlessness of the Pakistani border region and the aggressiveness of the Taliban make for an ominous combination, anti-terror officials said. Until Sept. 11, 2001, Afghanistan was the land of jihad: hallowed ground where fighters from across the Muslim world helped vanquish the Soviet Union in 1980s, fought alongside the Taliban in the 1990s and filled terror training camps overseen by Osama bin Laden. Loss of the Afghan sanctuary scattered the networks and sent bin Laden fleeing toward the Pakistani border region, where many anti-terror officials believe he remains. After the fall of Saddam Hussein in 2003, jihadis from the Arabian Peninsula, North Africa and Europe flocked to confront the U.S.-led coalition in Iraq. Although foreigners have been a minority in the Iraqi insurgency, militants such as Jordanian Abu Musab al-Zarqawi played a major role in spectacular suicide attacks and kidnap-murders. But insurgent leaders in Iraq are now mainly interested in foreign recruits ready to die in suicide attacks, anti-terror officials say. Moreover, the conflict is dominated by sectarian violence between Sunni and Shiite Muslims. In contrast, an accelerating Afghan offensive by the resurgent Taliban offers a clearer battleground and a wealth of targets: U.S. and other NATO troops, and the Western-backed government. As Iraqis have solidified control of their insurgency, the movement of foreign jihadis to Iraq has “significantly declined in recent months,” said Pierre de Bousquet de Florian, director of the DST, France’s lead counter-terror agency. Simultaneously, Bousquet said, anti-terror agents have detected a new flow of militants heading to Afghanistan. Iraq attracted many Arabs including Saudis, Yemenis and Syrians, Bousquet said. Algerians, Tunisians and other North Africans made up the second-largest group. About 100 fighters from Europe have gone to Iraq over a three-year period, he said. A leap in violence in Afghanistan this year has featured tactics such as suicide and roadside bombings that are trademarks of the insurgency in Iraq, according to Bousquet and other officials. Despite decades of warfare, suicide bombings were rare in Afghanistan. But the number of such attacks has shot up from six in 2004 to at least 78 so far this year. Jihadis from North Africa make the odyssey to Afghanistan through routes that converge in Pakistan, another senior French anti-terror official said. North Africans have been detected traveling to Quranic schools in Quetta and Peshawar, said Louis Caprioli, who retired as chief of the DST’s anti-terror division in 2004. The jihadis use the schools as covers for their presence in Pakistan and as staging areas to cross into Taliban-dominated areas of Afghanistan, said Caprioli. Foreign fighters are predominantly Sunni. But they increasingly prefer fighting alongside the Taliban to getting embroiled in the Sunni-vs.-Shiite bloodshed in Iraq, said Caprioli, who still works closely with the intelligence community as an executive of the Paris-based GEOS security company. U.S. Special Forces officers in Afghanistan learned last year that Arabs were being trained as suicide bombers in Iraq, then traveling through Iran to Pakistan, according to an intelligence document on a computer drive smuggled out of a U.S. base in Afghanistan and sold at a bazaar in April. Extremists transported the aspiring bombers, mostly Yemenis and Syrians, from the city of Quetta across the border into Afghanistan, according to the document on the drive. Basir Salangi, a police chief in eastern Nangarhar province, said Arabs, Chechens and Pakistanis conduct suicide and other attacks in the border regions, but that attacks in Kabul are primarily carried out by Afghans who have been trained in Pakistan. And the combatants in Afghanistan still are overwhelmingly Afghans. Afghan officials rarely have been able to offer proof of the presence of foreign militants by producing prisoners, identifying corpses or providing captured identity cards. Afghan officials allege that key training centers for the Taliban are in Quetta, Peshawar and Miramshah, and that militants use mountain routes in Paktia and Paktika provinces to cross the border. “There are foreign fighters from several countries who have sanctuary and training in our neighboring country,” said Gen. Zahir Azemi, chief spokesman for the Afghan National Army, referring to Pakistan. Pakistani officials deny such allegations. But they remind us that the world’s top diplomat can do nothing without the consent of UN member-states, and that the tendency, especially of the US, to blame the UN for anything that does not conform with national interests, only contributes to the organisation’s administrative problems. Peace and security is the highest goal of the UN, and Annan’s most significant legacy may be the broadening of the concept of security to embrace conflict prevention and resolution, development and human rights to create ‘a larger freedom’. Although the number of armed conflicts in the world is said to have declined over the last 15 years, the UN now has a record 90,000 peacekeeping forces in 18 operations around the globe, with an annual peacekeeping budget of about $ 5 billion. Domestic conflicts often spark international conflicts, and, as the recent conflict in Lebanon showed, all too often only a multinational UN force is acceptable to the different warring parties to keep the peace. Not surprisingly Annan has overseen the creation of a Peacebuilding Commission within the UN to steer war-torn countries from conflict and to put them on the path to economic recovery and stability, tackling not just the military causes of conflict but also their deeper social and economic roots. Since 9/11 countering global terrorism has been a high priority of the UN. The General Assembly devised a counter-terrorism strategy in 2006, but member states have yet to agree on a definition of terrorism. Meanwhile terrorism and some of the national responses to it are spreading fear and suspicion between and within some states – Afghanistan and Pakistan illustrate this well. A new Human Rights Council was created last year to increase the chances of excluding authoritarian states, but its teething problems are a reminder that the UN cannot be an association of angels. Poverty is a source of conflict, and the Millennium Development Goals, enunciated in 2000, have highlighted the need for global cooperation on reducing poverty and the incidence of HIV Aids and other lethal diseases, increasing gender equality, primary education and environmental sustainability. In 2002, the International Conference on Financing for Development (“Monterrey Consensus”) set in train a partnership to achieve internationally agreed development goals, but Annan admits that very few countries are on track to reach the MDGs on target by 2015. Paradoxically, while the illegal Anglo-American invasion of Iraq in 2003 challenged the raison d’etre of the UN, American requests for UN help in rebuilding Iraq have only confirmed the indispensability of the organisation. But there is still no international consensus on what constitutes a threat and when the use of force should be authorised and by whom. Annan’s successor, Ban Ki-Moon, is also likely to find that the world’s chief communicator can influence, even if he has no power. But being UN Secretary-General is not roses all the way, and inevitably, the roses have their thorns. Pointing to the sizeable population of OBCs in several constituencies of the state, the leaders have said that any raw deal can force them to look for alternatives. Referring to the decision some time back to divest Malkait Singh Birmi of his portfolio and the near total absence of former PCC chief H S Hanspal from major political functions, OBC leaders feel that the state leadership was not doing enough to retain the support base among the OBCs. The countdown for the Presidential election has already begun. With President A P J Abdul Kalam, whose tenure ends in June next year, indicating a return to academics, there are many who have thrown their hat in the ring at this early stage. While the names of Lok Sabha Speaker Somnath Chatterjee and Vice President Bhairon Singh Shekhawat have been doing the rounds, the latest to join the fray is Uttaranchal Chief Minister and veteran Congress leader Narayan Dutt Tiwari. The Congress leader, who had indicated his desire to retire from active politics, is reportedly being persuaded to lead the party during the forthcoming assembly polls in the hill state. Tiwari is being led to believe that he would be considered for the post of the First Citizen. However, the Communists have taken out their notebook to calculate the number of votes they can garner in the electoral college. As per their arithmetic, the Congress can only hope to persuade parties like the RJD and the DMK to back its candidate. They feel that other secular parties – the NCP, SP, TDP, BSP, RLD and the AIADMK – are unlikely to support it. But Chatterjee can hope to also get the votes of NDA allies like the Janata Dal, Biju Janata Dal and the Akali Dal. The Presidential poll, a Left leader said, was a golden opportunity for the Communists to bargain with the Manmohan Singh government and have their person in Rashtrapati Bhawan before they embark on the Third Alternative project. Will they succeed in their revolutionary zeal will be worth watching. Till now the international media may have viewed India as the land of elephants and Maharajas but the perception is all set to change and the country could soon be known for the Tatas. That is how some international newspapers wrote about the acquisition bid by Tata Steel Ltd to take over the Anglo-Dutch steel maker Corus Group, which is seven times the size of the Tata company, for about eight billion dollars. In fact, the Tatas are already present in more than 50 countries and through its tea, auto, steel, and software products they seem to have become the brand name for India. The group companies have a presence in almost all sectors ranging from salt, chemicals, agriculture, retail, software, auto and manufacturing. Unlike the acquisition of other international companies, the Tatas have been praised for following ethics and good corporate governance as well. Industrial captains admit that apart from Infosys’ icon Narayana Murthy, Tata Group Chairman Ratan Tata has become a brand name for India Inc abroad. Sarod maestro Amjad Ali Khan’s performance at the prestigious Carnegie Hall of New York on Saturday will be a musical tribute to Mahatma Gandhi. A piece has been specially composed and set aside for the concert that will also have the maestro’s two sons Amaan and Ayaan playing alongside. While the maestro is happy to be playing at Carnegie, he claims he is equally contented playing to audiences at home. His only regret is that while Delhiites love good music they hate to pay for it. In stark contrast is the audience in Kolkata for which the musician was all praise. Commenting on the etiquette of the Bhadralok audience Khan said they not only stay put till the very end but also buy their tickets.